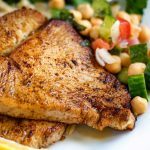 Explore the taste of steaks with this low carb blackened tuna. With cajun seasoning and butter, you will enjoy this flavorful dish over a fancy dinner! Heat oil and butter in a large skillet over high heat. When oil is nearly smoking, place steaks in pan. Cook on one side for 3 to 4 minutes, or until blackened. Turn steaks, and cook for 3 to 4 minutes, or to desired doneness.